After 37 years sitting on the seabed in the Falklands, the SS Great Britain was brought back home to Bristol in 1970. Exactly 40 years since its return, it has been restored to its former glory with a little help from the Duke of Edinburgh. For the 100,000 people who lined the banks of the River Avon in Bristol on 5 July 1970, it must have been a strange sight. There to welcome home one of the jewels of Britain's maritime history, the dark rusting hulk which slowly came into view must have seemed like a disappointment. On that boat was the Duke of Edinburgh. "There were a lot of people there, I think they were intrigued," he said. "The story was fascinating. The dock they built her in was still there, untouched, after all that time. It was extraordinary. There was a real sense of occasion." 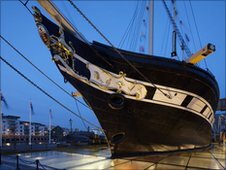 Like a mortally wounded warrior from the battlefield, the SS Great Britain limped home to her birthplace, a shadow of her former glory. This was the culmination of a salvage operation which at times seemed futile. The ship has now become a museum, with over 150,000 people visiting it each year. The SS Great Britain was the world's first iron-hulled screw-driven ocean liner, propelled by a combination of steam and sail power and launched from Bristol in 1843. She criss-crossed the Atlantic, made 32 runs to Australia with emigrants, served as a troop ship in the Crimean war and the Indian Mutiny, and later became a cargo ship. The ship was eventually scuttled in the Falkland Islands in 1937 after 50 years as a storage hulk. It had been a sad end for a great ship. Then came the daring rescue mission. "She was a ship-shaped lump of iron, rust, and scrap," said Ivor Boyce, one of the tugboat skippers who gently towed her home. He remembered telling his friends: "What are they going to do with her? No way can they make that into a viable ship anymore." Many others though were swept away by the romance of the story. The daring rescue 8,000 miles from home, the near impossible task of raising Isambard Kingdom Brunel's great iron steam ship from the sea bed, the perilous journey across the Atlantic - all this stirred the hearts of Bristolians.